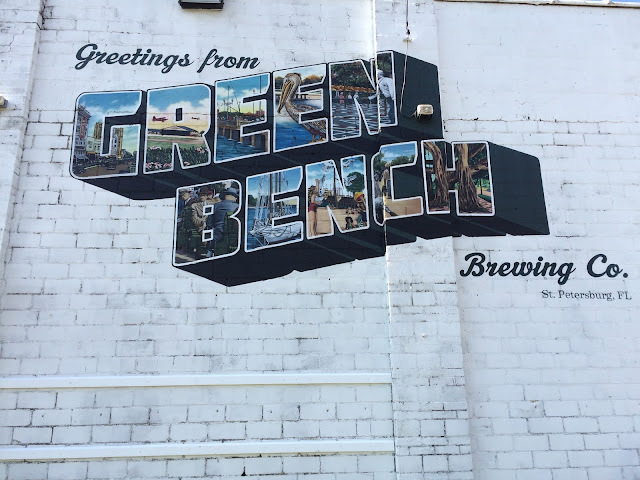 After leaving our awesome visit at Pair O' Dice Brewing, my wife and I headed south toward St. Petersburg's Green Bench Brewing for Stop 9 on #EpicTampaBreweryTour! We arrived promptly at their noon opening, well, after we looked around and decided the nearby Thai restaurant was where we were going to each lunch afterward. 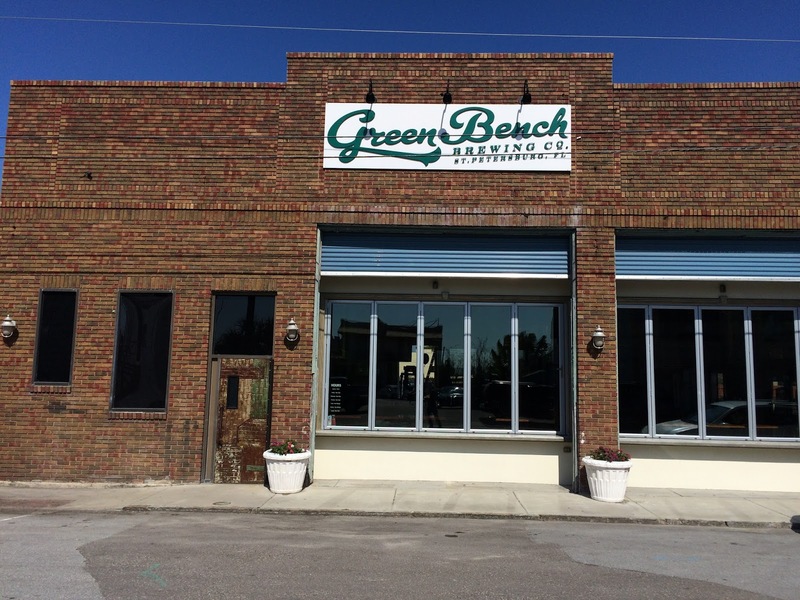 Green Bench is located walking distance to Tropicana Field where the Tampa Bay Rays play. Good thing I don't live there and am not a Rays fan - could be an addicting combo. The Phillies, however, have been doing Spring Training in nearby Clearwater forever - Hmmm! The brick building with large glass windows is terrific, super rustic. 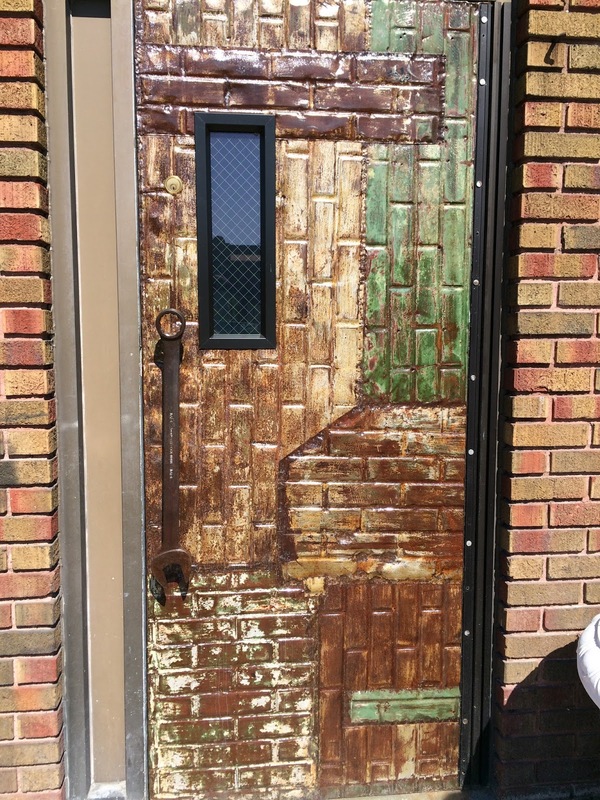 The front door to the brewery is pretty cool, too, created with different colored and interlocking bricks; oh, and a gigantic wrench for a handle! Inside, very modern and spacious, tall ceiling, tons of sunlight. 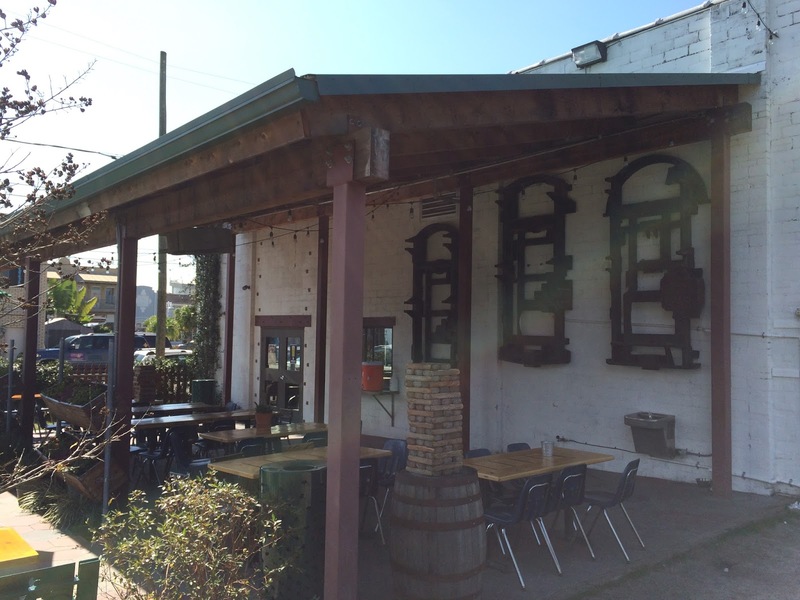 A picture window allows views into the brewing area. And one other super notable: an enormous buck head mount guards the taps! Felt a little "Pennsylvania hunting lodge" out of place but I'm betting one of the owners is a big hunting fan. The brewery offers tours on Saturdays from 12-4 pm. I did ask beforehand if there was potentially an opportunity that particular Tuesday but never heard back. As the place had just opened, we sat where we wanted, inside at the bar first, near the taps and screen showing what beers were being served. Just to check, we asked if they served food. Green Bench doesn't serve more than a few snacks, but there are a bunch of restaurants nearby including the aforementioned Thai place we ended up eating at and a Mexican joint right next door. The guy next to us recommended the Mexican place. When I asked if he was a local he said, "No, but I've eaten there every day since my visit started a week ago." LOL, and we shifted seats away from him! It's apparent that this brewery rotates their taps a lot, considering that three of the five above are not currently on tap just a week and a half after our visit. 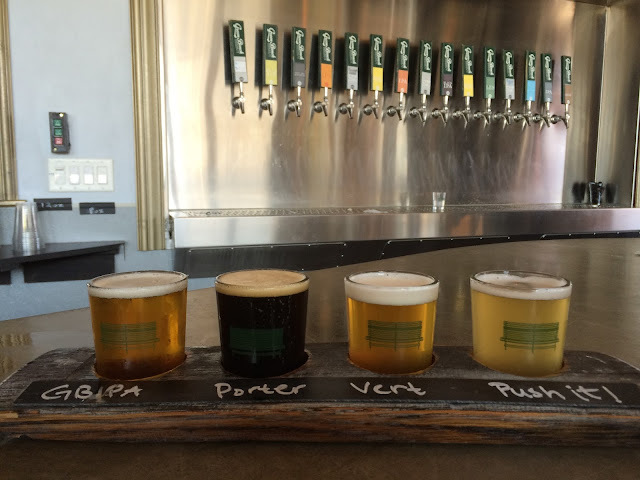 That is pretty cool, especially for the locals so they get a chance to try a lot of different beers and styles. After ordering, we took a few pictures and decided to go outside and enjoy the beautiful day and huge patio/beer garden. 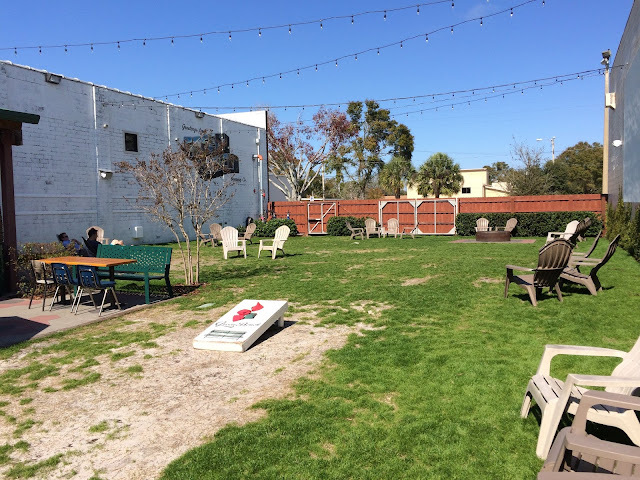 Lots of tables, games, a fire pit, and plenty of space (kid friendly I read somewhere). 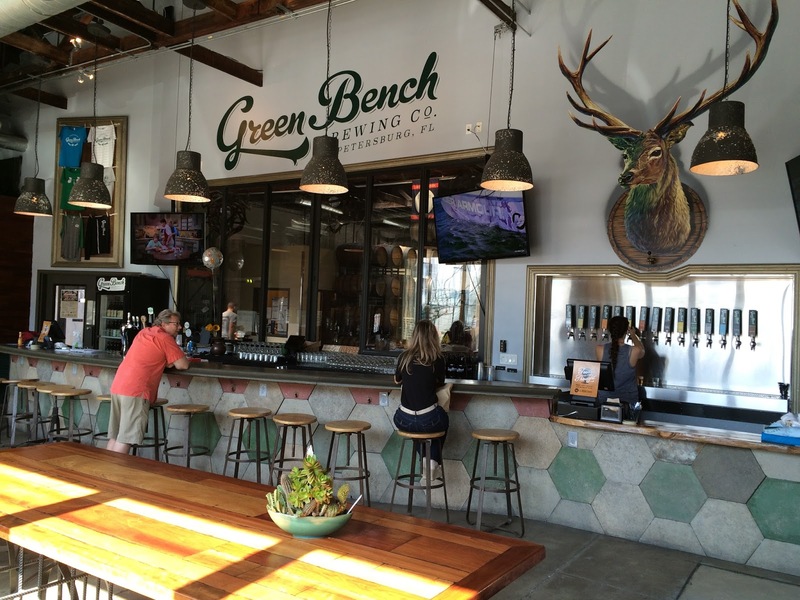 You go to Green Bench Brewing, you are obligated to drink their "bench-mark" Green Bench IPA! That's just the way it is. Very tasty, excellent orange and citrus, nicely tropical as well with hints of peach, followed by some good pine bitterness; hoppy, resinous, fresh, terrific! I got a pint after the flight was finished too. Palladium Porter had a great chocolate and coffee flavor with some roasty bitterness; very hoppy especially at the finish, also showing some citrus and subtle fruit. Saison de Banc Vert (Green Bench Saison) is a gold medal winning beer. Terrific fruity orange and peach with some spicy balance and lots of yeasty nuances. Very good! Push It Gose, very salty, lightly tart, refreshing, lemony. I asked about a porter that was just kicked, so instead I got a taste of Breakfast Porter, just tapped. Sweet chocolate and you can definitely taste the maple syrup the beer was brewed with. Was good but my wife didn't want a full glass. So that was the end. We just relaxed in the shade until our beers were gone. Next stop after the Thai lunch, which by the way was delicious, big portions, fast service... Hidden Springs Ale Works.